Jiaozi is a Chinese dumpling and it is a hot favorite among Chinese households. Jiaozi can be steamed, boiled, or pan fried. 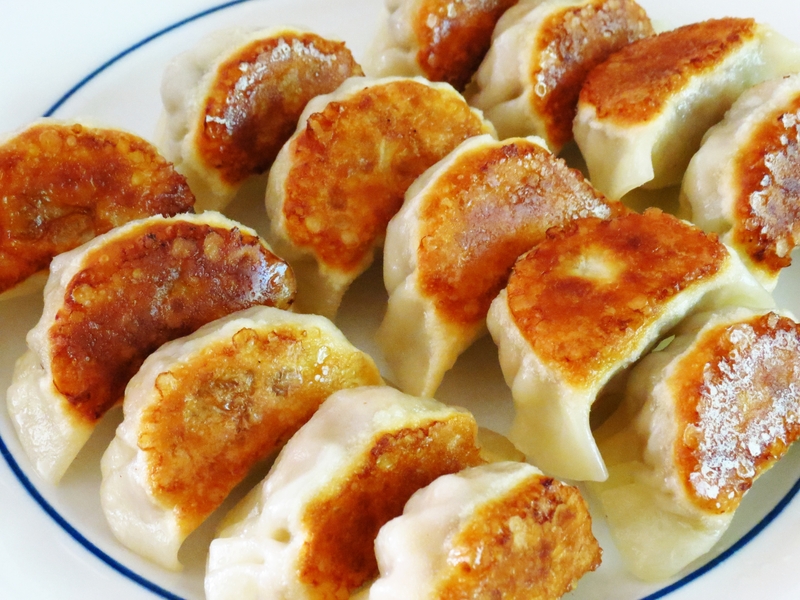 The pan fried version is known as guotie (pot stickers) or gyoza in Japan. As the name implies, the dumpling stuck slightly to the wok at the end of cooking but it could be easily removed by nudging it using a spatula. While jiaozi filling commonly consists of meat and/or vegetables, there’s no limit to what you can add in it. You can make the filling with the ingredients you like/have on hand. Both taste and textures are very important in dumpling making. For me, I love to add shitake mushrooms, carrots, and wombok leaves together with the mince pork to produce different textures (bitey and crunchy). The filling smells and taste wonderful with the addition of seasonings such as sesame oil, shaoxing wine, good quality soy sauce, grated ginger, and garlic. The wrapper and wrapping style for guotie is different from deep fried wontons. Guotie wrappers are white in color, round-shaped, and thicker compared to wonton wrappers. My first jiaozi attempt which was 3 years ago was unsuccessful and I ended up with disintegrated dumplings as I did not seal the dumpling properly. Make sure you pinch the edges of the dumpling firmly so that they won’t break apart when cooking. Crispy skin on the bottom and tenderly soft skin on the top. Roasting a duck is a little trickier than roasting a chicken or pork belly due to the thick layer of fat underneath the duck skin. In order to obtain crispy duck skin, it is crucial to drain all the fat. 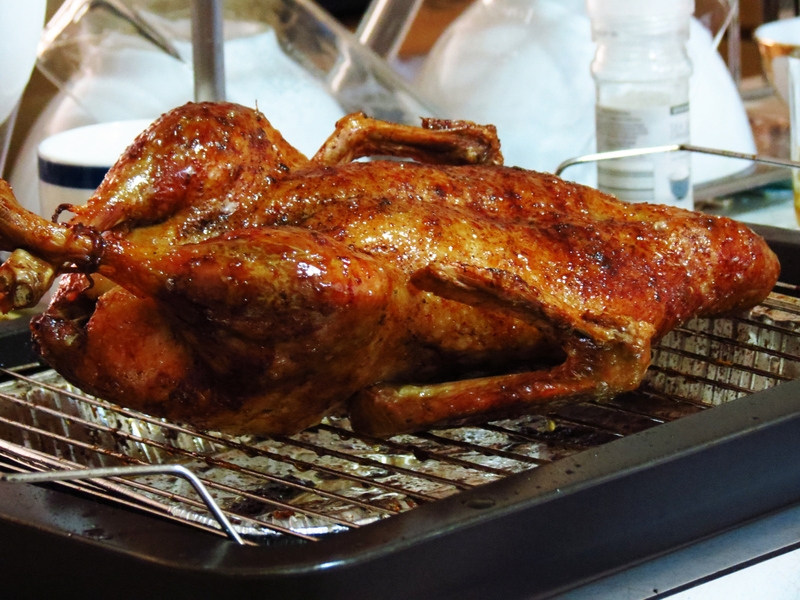 Various methods have been employed to achieve thin and crispy skin duck and these includes steaming the duck over boiling water, air dry the duck for a few hours before roasting, using an air pump to separate the skin from the fat layer or pierce the skin of the duck to render all the fat. I opted for the piercing method as it is the simplest approach. The whole duck roasting and resting process took about 4 1/2 hours but I can assure you that it’s all worthwhile. The duck meat was so GOOD, moist and tender and the skin, although I would prefer it to be a tad crispier, it’s still delicious. Next time, I’ll bake it at 400 °F for 12 min instead of only 7 min for extra crispy skin. 4 hr roast duck. Extremely succulent meat. 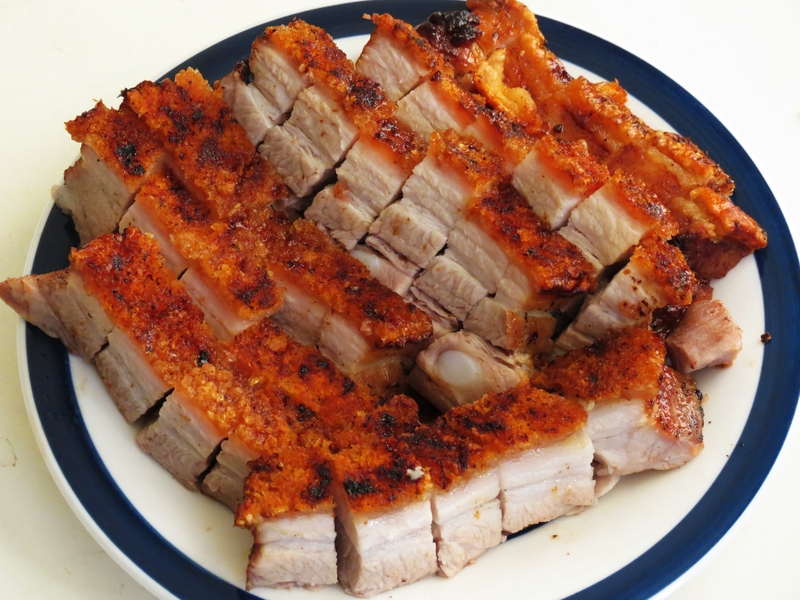 When cooking siew yuk, it’s important to get good crackling skin as if it’s not crackled completely, the skin will be tough and chewy. The tricks of getting crispy crackling skin are to dry the skin, prick holes on the skin to render the fat, and grill the skin for a few minutes in the oven at the end to blister the skin. The marinade for the meat consists of five spice powder, nam yee, garlic, sugar and salt. I suggest that you try to source the best five spice powder possible as it does make a difference to siew yuk taste. My favorite would be the popular Pok Aun Thong’s five spice powder from Penang. It has a deep red color and I found that it’s more fragrant than the other brands that I had tried thus far. Unfortunately, they don’t export their products so whenever I go back to my hometown, I would bring a few packets over to Australia. Nam yee is a red fermented bean curd which is a must have ingredient for siew yuk marinade. Fermented bean curd is basically preserved tofu soaked in flavored brine and is usually used as a condiment in congee, porridge, braised dishes or vegetable stir-fries. Red fermented bean curd incorporates red yeast rice with brining liquor giving it red color. Nam yee is used a lot in meat dishes as it’s very aromatic and flavorful. Who doesn’t love crunchy deep fried wontons? They are great as party food, snacks or as accompaniment to rice. In Malaysia deep fried wontons are also served with egg noodles, char siu (barbequed pork) and choy sum (asian green) dressed with dark and light soy sauce (a.k.a dry wonton noodle). With ready-made wonton wrappers easily available in the supermarket, making wonton is a breeze. Wonton filling mainly consists of mince pork, prawn, water chestnuts, spring onions, and seasonings. Cornflour and egg white are used to bind the ingredients together. 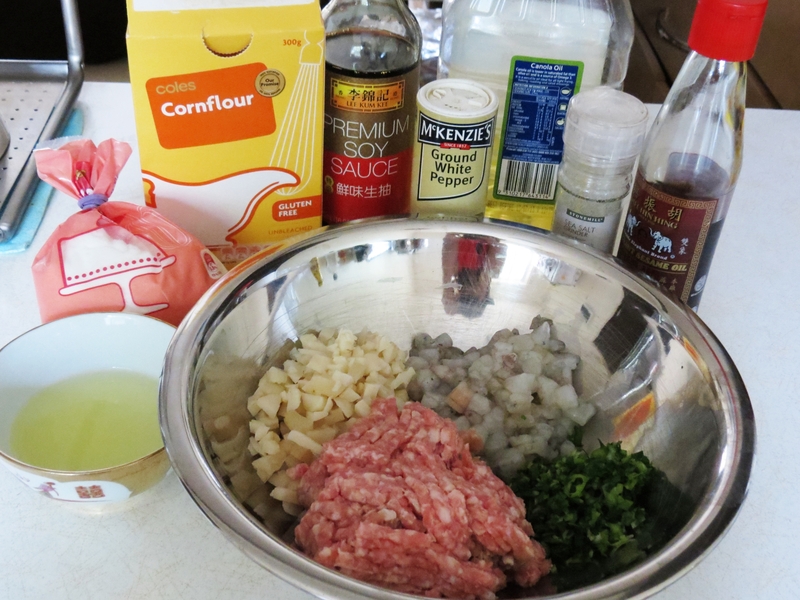 To obtain a good wonton filling texture, do not add in too much mince meat and do not compact the meat like you do in making meatballs. You do not want a filling that’s too dense in this case. 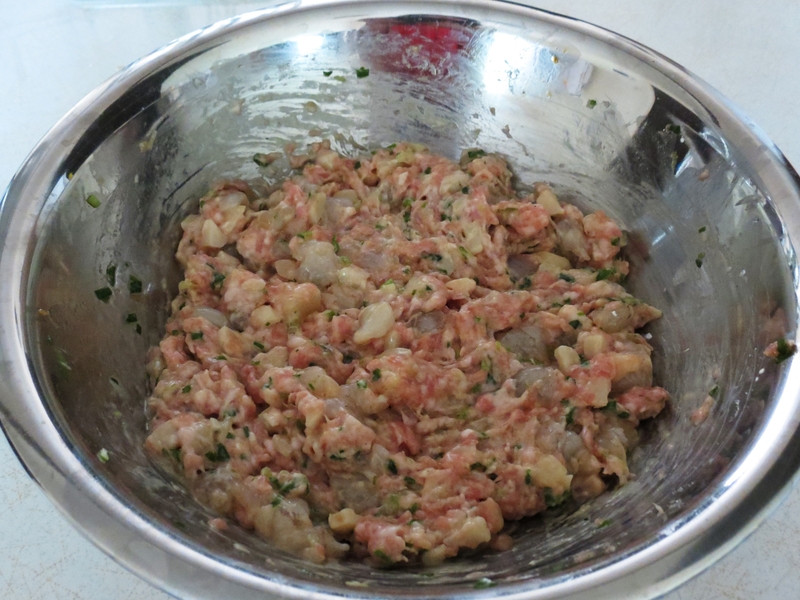 I like to put in a lot of roughly chopped water chestnuts and prawns to give the filling a crunchier texture. There are various wonton wrapping methods or techniques available on the internet depending on the wonton shapes. The wonton shape that I usually make resembles a hobo’s bindle which is simple, quick to make, and suitable for beginners. One time, Mr. D’s mom cooked this for dinner and I instantly liked it. It is something different from your usual pasta dish and taste awesome. Furthermore, it is super simple to cook and extremely versatile. You can use/add whatever ingredients you fancy (prawn, squid, chicken or beef) to the pasta. The combination of worcestershire sauce, tomato sauce, and chilli sauce creates a tangy sweet and sour taste with a subtle hint of spiciness that will appeal to those who loves sweet and sourish food. It is important to ensure that the pasta is not overcook in step 1, or else it’ll end up unpalatable as the pasta will cook further in the wok and it’ll be sticky and gluggy. Hence, it is advisable to cook the pasta 1-2 min less than the stated time on the packet. I used smoked bacon but you can use whatever ingredients (meat/cured meat/seafood) you have in your fridge. Puree the diced mangoes with the orange juice. Japanese curry rice or karē raisu is Mr. D’s favorite and whenever I cook this dish, he’ll jump for joy like a little boy in a candy store. Japanese curry is very popular in Japan and you can easily get it in any fast food shop or cafe. Unlike Indian or Malaysian curry which are on the spicy side, Japanese curry is not spicy, has thicker consistency, extremely aromatic and slightly sweeter. It is a very appetizing dish and Mr. D couldn’t have enough of it. This dish is simple and quick to prepare as you can use store bought Japanese curry roux in block form. There are an assortment of instant curry roux which are easily available in any Asian groceries store. The major brands are from House Foods, S&B Foods & Ezaki Glico. In our quest to search for the best instant Japanese curry roux, we tested the different range we could get hold of such as the S&B Golden Curry, S&B Tasty Curry, House Vermont Curry, House Java Curry, and House Kokumaro Curry. Our verdict: Kokumaro Curry from House is without a doubt the best curry among all the instant Japanese curry we tried as it’s seductively aromatic and tantalizing. It tastes as good or even better than the ones serve in the Japanese restaurant here. It comes in a box with 2 blocks of curry roux and each block yields about 5 servings. Finely diced shallots, bite-sized chicken, diced carrots and potatoes, and Kokumaro instant curry roux are all you need. Itadakimasu! Honto ni oishii desu!